St. Lucie West dentists can tell you that the last teeth to appear in your mouth are your wisdom teeth. Many times, there is not enough room for these teeth to protrude. When this occurs, you may be in need of some help with your oral and maxillofacial treatments for the removal of these problematic teeth. Impacted Teeth Extraction. When a normal tooth does not erupt in the mouth, it may cause problems below the gum line. For example, you may experience pain, infection, or tooth decay. Also, impacted teeth may cause damage to healthy teeth. During removal surgery, you will be placed under sedation. A flap of gum tissue is cut so that bone can be accessed. A tiny opening is made in the bone to reveal the impaction. The tooth is cut into pieces and is removed through this opening. The flap of gum is shut and stitched closed. Wisdom Teeth Extraction. 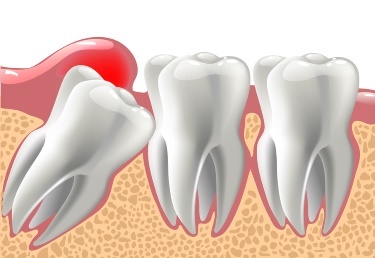 Many people have impacted or partially impacted wisdom teeth. The removal process is similar to a regular impacted tooth extraction. You will be numbed, and an incision will be made to expose the tooth. The bone that is blocking the tooth’s root will be removed, and the tooth will be divided into sections. These segments will be removed, and the site will cleaned before it is stitched closed. After surgery, your anesthesia will wear off, and you can expect bleeding until the area clots. To manage pain, ice packs and OTC pain relievers will be helpful. In severe cases, your dentist may prescribe a stronger medication. A bit of bruising or swelling is normal, but it should subside within a few days. The day following surgery, you may resume normal activities. However, you should avoid strenuous situations that may disrupt the clot. You should drink plenty of water but avoid anything hot, alcoholic, or caffeinated. Since suction may harm the area, do not drink from a straw or smoke cigarettes. Until the wound heals, you should eat soft foods. To clean your mouth, rinse with salt water every two hours. After 24 hours, you may resume gentle brushing. Dr. Jade Thomas at Banyan Dental in St. Lucie West has completed countless oral and maxillofacial treatments. Wisdom tooth pain is often uncomfortable and should be treated. If you suspect problems, it is wise to seek dental advice before your oral health suffers.